Have you driven a 1987 Chevrolet Camaro? Displaying 41 - 50 of 50 1987 Chevrolet Camaro reviews. Its A Hot Rod Its Not Suppose To Be Dependable — Its my baby and ill never get rid of it. so i say now i guess if the right girl comes around and begged me to i would. A Great Memory — It was a fine ride for awhile now i want a newer one as long as it has t-tops my fav. Inexpensive Stylish N/a Sports Car — Good performance from a V6, very good gas mileage, handles well, recommend a 5spd over the automatic. Go with the T Roof, forget the AC. Best Car Ever! — Well, You have to drive one to understand one. The car does require maintenance here and there, But so does any car of this year. The power (For a v6) is awesome! The car handles very well and you feel invincible when driving it (Which isn't necessarily a good thing... Lol) I would recommend this car to anyone who can understand the bond a man (Or woman) and his (Or her) car can truly have (Yes, I know I sound corny, But camaro owners understand) So in conclusion, a 1987 Chevrolet Camaro as far as I am concerned is the only car I will drive until the end of my days! Best car ever! L98 V8 Ruled That Year. — I only had the 1987 IROC for a little over a year,I opted to buy one with the L98 engine package and at that time it was a great deal of money.So I finally had to sell it because I could not afford the car payments and the insurance both.I was only 19 years old at the time so the insurance companies had alot of fun charging me around $2000.00 a year for coverage.But I loved that car.The L98 5.7 Lit. TPI. produced 225BHP@4400 and 330 ftlb of torque@2800. In other words when you kicked it HOLD ON. 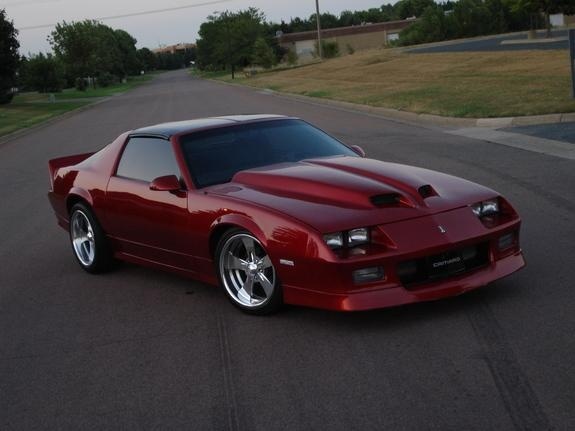 There were many other engine opions that year for the IROC but the L98 was the fastest of the bunch.The LB9 was only 215HP,and came with the 5.0lit 305ci engine.And you could go all the way down to the LG2 5.0lit 305ci with 170HP with the 4bbl or 190HP with TPI. This was a car that I still regret not keeping.If your a lucky enough to get one in good condidtion hold on to it.With a little work and some after market performance parts you can get 350-400 HP and really have some fun. Awsome Fast Fun And Safe Car. — Fast acceloration, holds corners better than any other car, low gas milage, but a fun car to drive. baught for low cost and maintained for low cost. you cant put this expirience into words so you go out and get on. Cons: restoration parts are a little pricy. Bought one of these new in 86 with a 5.0 HO and 5 speed manual. Loved it! Got divorced in 90 and had to sell it. Im still not over the loss. Of the car, I mean! Looks/Style Ranked 1979 Chevrolet Camaro better. "The 78 thru 81 Z28 had some of the coolest spoilers, hood, ground effects and stripes of any generation camaro." Family Car Ranked 1979 Chevrolet Camaro worse. "I think the hatchback and folding rear seat was more versatile when it comes to cargo." Front Seats Ranked 1987 Ford Mustang LX Convertible better. Cargo Capacity Ranked 1987 Ford Mustang LX Convertible better.